Crimson Tide vs. Seminoles-September 2, 2017 Forget trying to find parking and trying to fuel your vehicle for the two hour drive to "The A" for the big game at the New Mercedes Benz Stadium. Leave the driving to us. Birmingham Charter Service LLC would love to have you come along with us to tailgate the game. Seats: $55.... PICK UP LOCATIONS & TIME: Wal-Mart ROEBUCK @ 9:00am DEPARTMENT 9:30am Wal-Mart BESSEMER @ 10:00am DEPARTMENT 10:30am Wal-Mart HOOVER @ 11:00am DEPARTMENT 11:30am...... Will return immediately after the game. 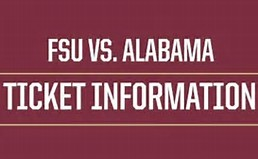 BOOK YOUR SEATS NOW TO SEE THE ALABAMA CRIMSON TIDE TAKE ON THE FLORIDA STATE SEMINOLES, SEPTEMBER 2, 2017 @ THE MERCEDES BENZ STADIUM IN ATLANTA, GA.